WALDOBORO – Democrats from throughout Lincoln County came together during the annual Lobster Bake and Family Fun Day, Sunday, Aug. 12, at Waldoboro’s Cider Hill Farm. 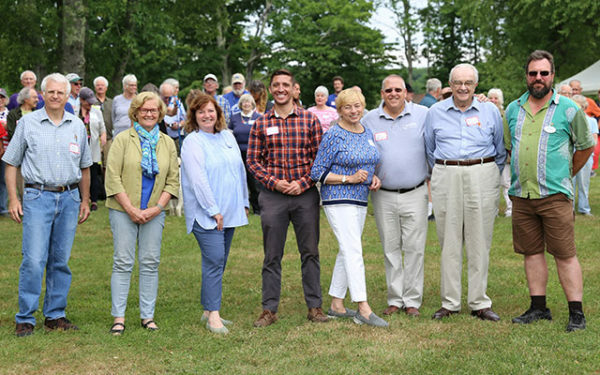 Eight local and statewide candidates, including U.S. Congresswoman Chellie Pingree, Zak Ringelstein, candidate for U.S. Senate, and State Attorney General Janet Mills, candidate for Governor, joined nearly 150 fellow progressives for an afternoon of music, food and lively conversation. The afternoon began with The Oystermen providing a background of folk music as guests renewed acquaintances, made new friends, enjoyed oysters provided by The Pemaquid Oyster Co., and discussed the issues of the day with candidates who moved among the crowd. LCDC Chair Chris Johnson introduced Mills, who has challenged the current administration and provided life-saving Narcan to the law enforcement agencies throughout the state. She acknowledged that her opponent, Shawn Moody, has promised another four or eight years of Gov. LePage’s policies while voters want a governor who will work across the aisle and move the agenda along. Mills also emphasized that she and the voters will stand up to polluters, pharmaceutical companies and Wall Street giant and work to keep our air clean and make sure voters understand that climate change is real. In her remarks, Mills also pointed out that we should produce our own renewable energy, produce good-paying jobs, and provide for one another through access to healthcare. When Jeff Hurd, owner of The Narrows Tavern and caterer for the event, called everyone to dinner, the candidates pitched in and helped serve. Seated comfortably under the Democrats’ big tent, the crowd tucked into dinner. Johnson asked Congresswoman Pingree to make some remarks. Pingree spoke about her experience visiting the immigrant detention centers in the Southwest and noted that the conditions moved some members of Congress to tears. The pointed out how many of these people are applying for asylum and asked the audience to think about the Trump administration has done in the name of the United States. Lincoln County Sheriff Todd Brackett, Jason Putnam, candidate for HD87, Maine House Representative Mick Devin (HD90), and County Commissioner Bill Blodgett (D2) also addressed the crowd, delivering a unified message that echoed Mills’s declaration including that Democrats in government will bring compassion to the job, value teachers, and support veterans and seniors. The LCDC offers many “meet the candidates” events across the county, along with other group discussions and meetings. Learn more at http://lincolncountydemocrats.com/calendar or www.facebook.com/lincolncountydems/.